100 miles per hour, in your face, fully interactive Oompah show.... louder than any Rock Band! 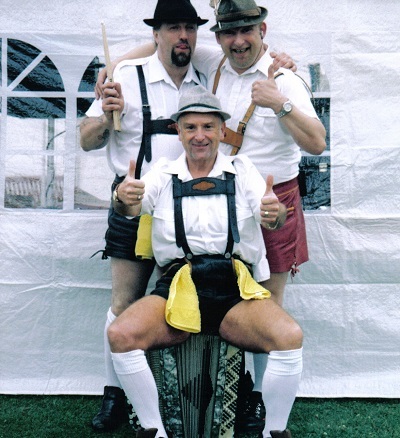 This is an Oompah Band with added extra, perfect for Oktoberfest parties and events! A fast moving exciting Oompah band with lots of thigh slapping audience participation and fun. Top quality professional Oompah band that has been resident at the Birmingham Bier Keller. This is a versatile band that would please all age groups, capable of working at any venue supplying what the customer required from traditional Bavarian music to the full Bierkeller party. As professionals they have successfully performed at most types of venues including civic centres, marquees, colleges, clubs, hotels, restaurants, village halls, theatres, military service camps, universities etc. The band adapts each show to your personal requirements, the band are happy to play to 30 people in the village hall or 2000 plus university students. Experience: Has worked with Frank Carson, Showaddywaddy, Des O’Connor, The Barron Knights, Mike Reid and Jim Bowen. Trusthouse Forte, Pioneer, Mercedes, various food and wine companies and most breweries. The Lions, Police and Fire Services, Young Farmers, R.A.O.B, and the Freemasons. etc.summer season entertainment for Pontins, Holimarine, Center Parcs, Haven Warner and Butlins.